These peaches and cream popsicles made with juicy, ripe peaches, yogurt, almond milk and almond extract make a wonderful treat on a hot summer day like today. It’s in the nineties today, the kind of day where you want to either sit in front of the air conditioner and never leave the house, or swim in the pool all day – we opted for the latter. I’ve been thinking about making a peach dessert combined with almond extract – because I love the smell of my peach-almond facial scrub, so I came up with this easy dessert using really ripe sweet peaches, unsweetened vanilla Almond Breeze almond milk and almond extract – delish! I used raw sugar to sweeten these, but you could sweeten them with stevia or whichever sweetener you prefer. My star shaped ice pop mold, which you can find on Amazon makes 4 oz popsicles, so depending on the size of your popsicle mold, you may get different amounts. Halve and pit the peaches. Cut the peach halves into 1/4-inch dice until you have 1 cup. Place the diced peaches in a bowl; set aside. Cut the remaining peaches into rough 1-inch chunks and place in the blender. Add the remaining ingredients and blend until smooth, scrape down the sides of the blender as needed. Pour the mixture into the bowl with the diced peaches and mix to combine. Divide the mixture evenly into the popsicle molds, or disposable small plastic cups. Insert the sticks and freeze until solid, at least 5 to 6 hours. Disclosure: This recipe was created in partnership with Blue Diamond Almond Breeze. 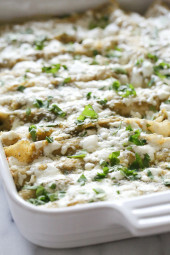 Gina, could I use cornstarch or something else to thicken lactose-free milk for this recipe instead of using yogurt? My husband is lactose-intolerant but he loves peaches. Think these would make a great snack for him while he’s dieting. Maybe try with coconut milk? I just came across this recipe and I’ve always been hesitant to try homemade popsicles because I’m afraid of it sticking in the mold. How do you prevent that? Any idea the cup equivalent to 3 peaches is? I'm wanting to use my fresh strawberries and raspberries. 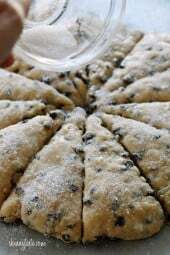 I would love to know how to make this with frozen peaches. Is it possible? I did and it is great. I had to let the peaches thaw just a bit. Could I use frozen peaches, & honey for sweetener? Hi, I'm dairy free at the moment so can't add the yogurt – instead of just almond milk which i guess would be too runny do you think i could add chia seeds to thicken it up? thanks! Hi from Australia, no peaches in season yet but about to try with fresh mango. Cannot wait. Quick question–did you peel the peaches? Thank you for this incredible idea! Just finished making mine with nectarines and used Greek style goat yogurt. So good!!!! If we use the vanilla coconut milk which I find to be sweet, will we still need the sugar? I don't have almond milk on hand so was going to use coconut water as a substitute…will report back. I'm guessing it will effevt the thickness..
it looks really good but isnt the purpose of drinking almond milk defeated when using yogurt?? I cant have dairy at all. Ugh I love yogurt too. I can try to make them without the yogurt. I like how your used your face scrub for recipe inspiration! I guess anything can really inspire people in the kitchen. 🙂 Your almond extract idea makes me want to whip up a batch of popsicles with vanilla bean paste! Can't wait to try it out! Love these! My daughter and I made them last night; yum!! YUM!!!!!! I love peaches!!!! Thanks for your recipe!!!!!!!!!!! Can I use light butter milk instead of almond milk????? This looks absolutely wonderful! I normally used fat free Greek yogurt, but it seems like that should work fine. Thank you for posting this. Oh my gosh! These look amazing!! 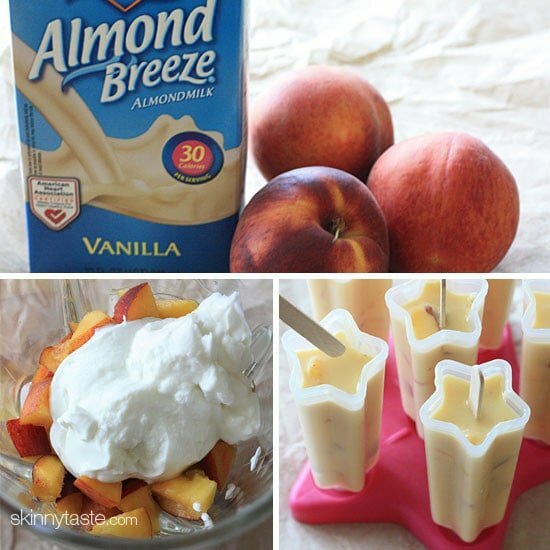 I love the combo of almond and peach. When my kids were little we had peaches and almond liqueur for dessert often…just enough to taste the almond flavour! I be making this recipe as soon as I can get peaches! These look amazing! 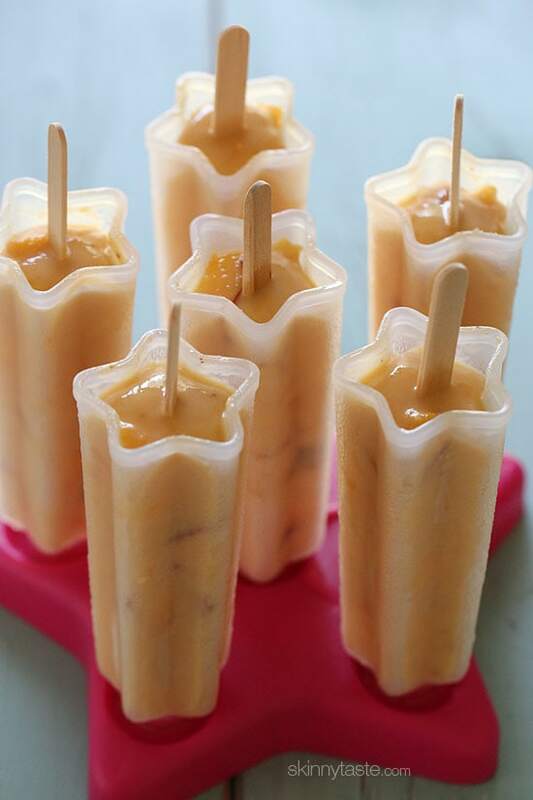 Where did you get the star-shaped popsicle molds? You can find the star-shaped molds on amazon.com (Tovolo Star Ice Pop Mold). Hope this helps! Cheers! Can't wait to try this! I'm going to try it in a plastic container since I don't have any popsicle molds. A question….would regular plain yogurt work instead of Greek? I don't like the taste of Greek. Thanks! If you have an Instant Pot it is super easy to make your own greek yogurt and NO YUKKY TASTE! Just google or pinterest greek yogurt instant pot and you will see. Just milk and 2 T of yogurt and voila!!! 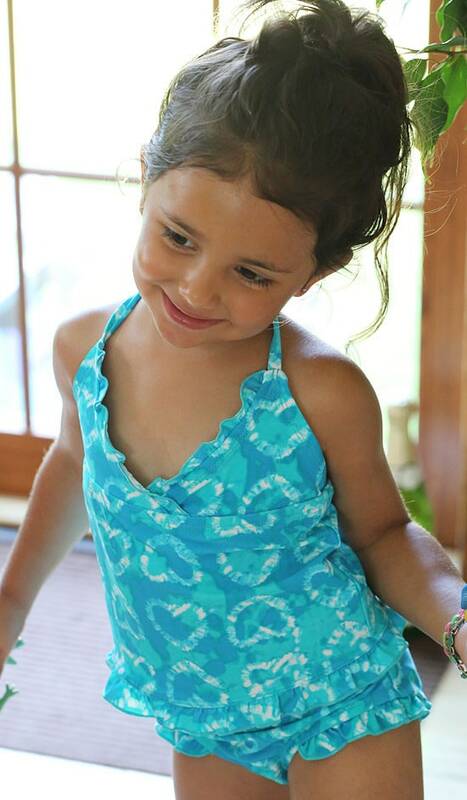 Your little girl is absolutely adorable! These beat anything you could buy at the store by a country mile. Almond milk is something I don't buy and I don't want to buy it just for this one recipe. Is there something else that I can use in place of the almond milk? There's a shelf stable version you can buy – they now sell 8oz singles of almond milk. Or a 4 pack of 8oz containers. All shelf stable. You could use any milk you have in your fridge. You can use Agave. It's better for Diabetes. Cheers! Question: If you used stevia, what would that reduce the sugar count by? I had gastric bypass, so I have to be very careful about how many grams of sugar. I try to keep it under ten. Thank you for this awesome looking recipe! I like do do a blend, but I use liquid stevia so I would say add it to your taste. Whoa! These look so good!! Used dates instead of sugar, nectarines, and 0% greek because it's all I had on hand. Awesome!!! Almond is my ABSOLUTE favorite, so next time I would probably increase that a bit but that's just my preference. Thanks for the great recipe Gina! Dates as a sweetener is an awesome idea. This recipe is right on time! I have some really ripe peaches just begging to be used. I don't like the taste of almond milk, do you think using coconut milk will have same consistency? these look delicious! I'm so glad to have found your blog and to start snooping through your recipes! Thanks for sharing. These are fantastic, Gina! 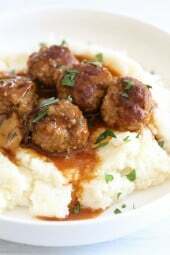 I love the flavor – so summery and creamy! Wow! These look delicious! Making them tonight..where did you get those molds? Amazon, see the link above, I made them with wooden popsicle sticks rather than the sticks that come with the mold, just a personal preference. I really need to get my hand on some popsicle molds! These look delicious! PINED!! 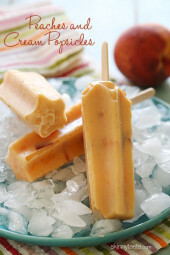 Can't wait to try these….and WHERE did you get those Popsicle molds?! LOVE! Amazon, I added the link above before the recipe. Oh wow these sound so yummy and so much healthier than most frozen desserts I find myself eating during the summer. And you're daughter is absolutely adorable by the way, just beautiful! Enjoy these hot summer days together.